Hello back my hackers, for the next several posts i will cover topics about wireless hacking, it should be a series-like post. I start from the basic, the foundation you need to prepare about to be ready for, either you or your Kali Linux. When i mention “Kali Linux” you could prefer to your own hacking OS. Between, i am not a fan nor Kali Linux savvy. It just my preferable OS to conduct any pentesting for myself. Let’s get started, To become a better Pen-tester, anonymity your self, cover your pentesting action, be undetectable from getting caught. When you noticed word anonymity don’t wondering first complicated things such proxy, vpn or sock whatever. Start from your device, before you wanna do some hack action, cover your Kali Linux a few seconds after it booted. Is it possible? what I need to do to cover my Kali within a few seconds? Yes, it is, it was your Media Access Control Address (stands for MAC Address). MAC Address is unique globally identifier to a network devices, it is often referred to as physical address. MAC Address consist of 6 byte binary numbers (48 bits) and written in format like ID:ID:ID:SS:SS:SS. The first 3 bytes are manufacturer ID number which assigned by internet, and the rest 3 bytes are serial number which assigned by the manufacturer. MAC Address, as i mentioned earlier it is in other word, your physical identity or supporting for hardware implementation, MAC layer represents layer 2 of the TCP/IP, whereas IP represents layer 3 and it supports software implementation. MAC is manufacturer assigned on every NIC, but doesn’t mean we can not manipulate our MAC Address. Finding MAC Address is easy, ifconfig command display your network interface and necessary information or ID on a list. Explore yourself! Macchanger build on CLI and GUI version. The GUI version package is “macchanger-gtk”. In this and most of my tutorial i am only cover command line things. 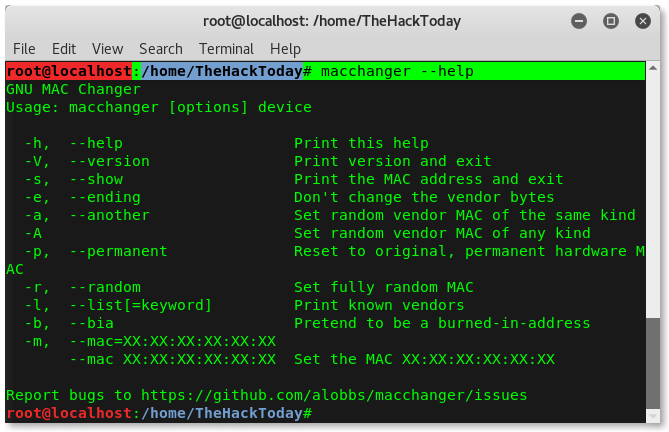 Lets take a look at macchanger help options display. 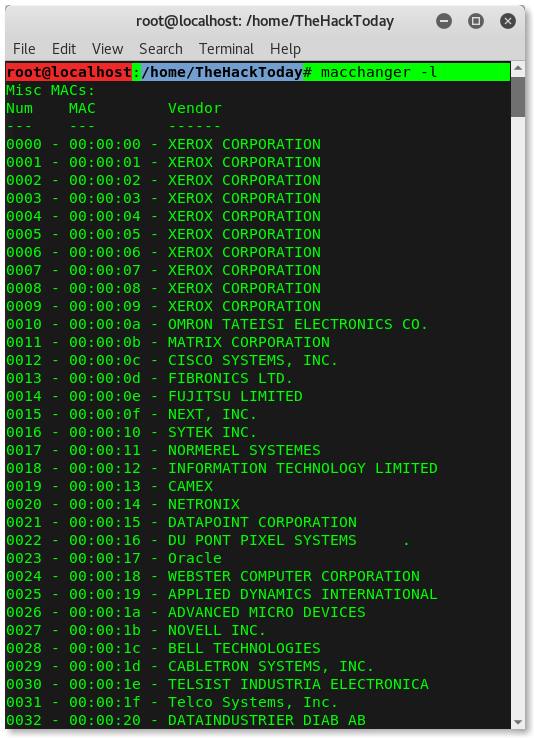 Too see list of available vendor and MAC, run the -l options. Before you set to fake the interface MAC address, make sure to bring it down and run as root user. To check whether your MAC successfully changed or not, if you are in doubt about this tool, run the ifconfig. Explore the rest available options by yourselves. If you are wondering how to reset to my original MAC address then? Don’t be worry bro, macchanger has to do it too. Did you notice option -P ? it is supposed to reset your MAC to original and permanent hardware MAC. We will get into more detail about wireless hacking series in the upcoming sections. These are the first steps and the foundation in getting all to be ready.